The PowerLift sports a 1200 mAh battery pack and offers an internal USB cable for easy recharging. It can offer an additional 20 hours of music playback, 5 hours of video, and 3.5 hours of talk time, which is plenty for many. Unfortunately, the PowerLift can not fully charge a completely depleted iPhone 4. While some competing solutions offer a more powerful internal battery, this is still a decent solution for a quick partial recharge if you can not find a power outlet. 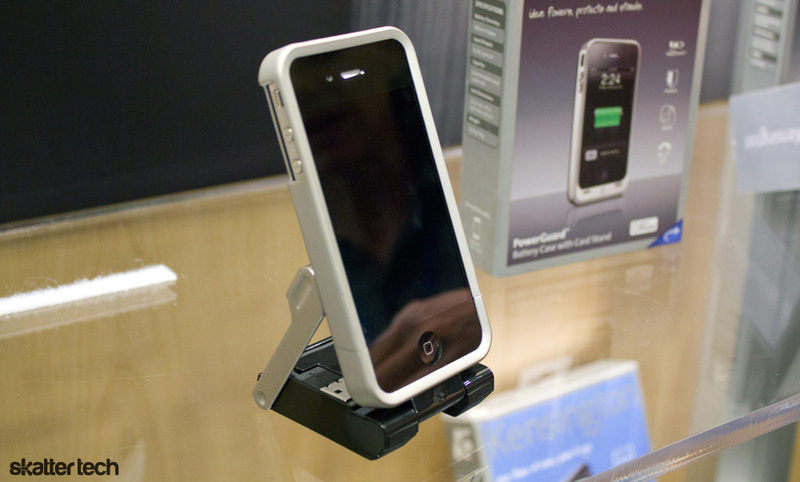 In addition to recharging capabilities, the stand keeps the phone upright for use as an alarm clock, photo slide show, watching movies, or FaceTime video calls. It also folds up into a smaller form factor for in-hand use. It is hard to tell where people will want an extended battery pack in this form factor, but it is at least an option. For those looking for a portable stand and battery pack, this is definitely a unique solution. However if you are simply looking for extra power while on the go, I would definitely recommend the Mophie Juice Pack Air which is a case with an embedded battery. For those looking to pick one up, the PowerLift is available for pre-order online for $49. Kensington did not provide n availability time frame.